Shower panels are increasingly becoming more popular, especially with the drive to conserve water and a bathtub used less frequently. The best shower panels all have one thing in common – they give your bathroom a luxurious feeling, imbibing a spa-like feel. 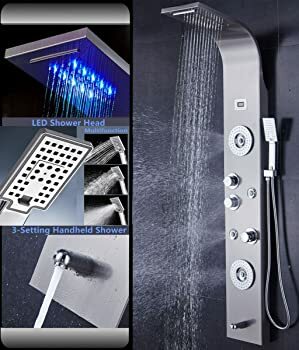 Add to this a handheld shower head and a glorious overhead rain shower head, with a few even having the option of a steam shower, and you have the personification of pure, decadent luxury. Please carry on and take a look at a few of the best rated shower panels around. Constructed from the highest quality stainless steel, this shower panel system also has a gorgeous brush stainless steel finish. 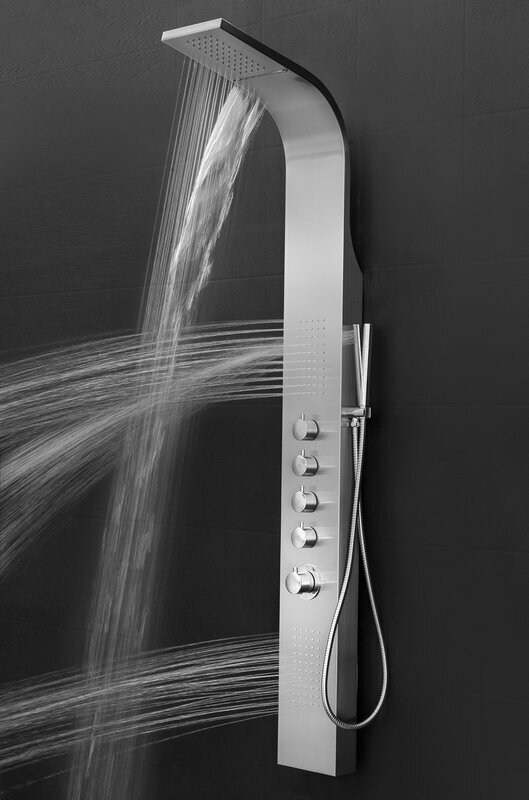 Opulent and beautifully designed, this system is sure to give you hours of showering pleasure. 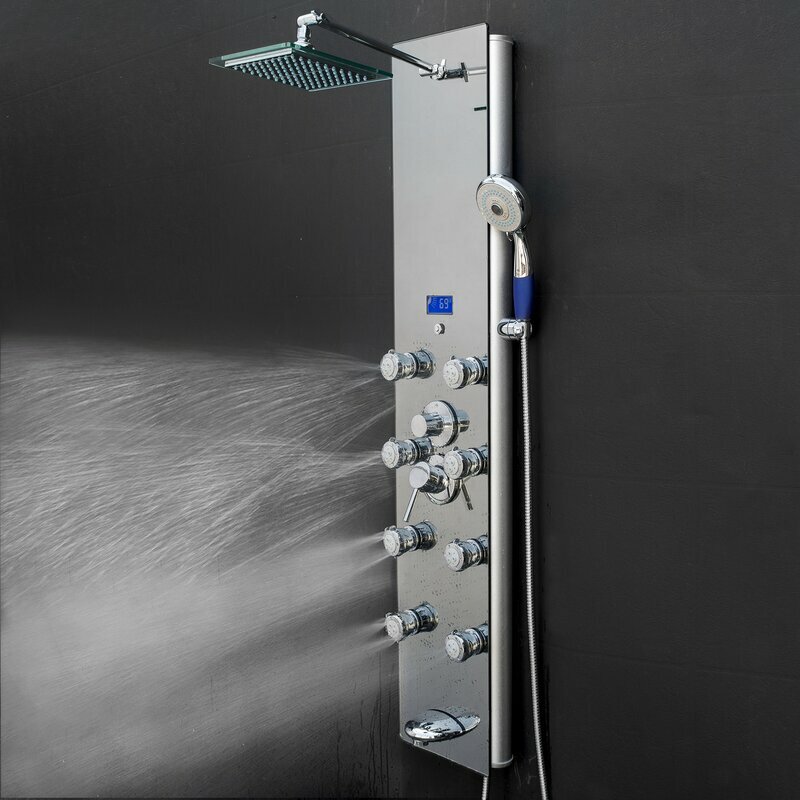 A system that includes a constant temperature system and a beautiful chrome-plated shower and wand hose, not to forget the waterfall shower head, and two body sprays. 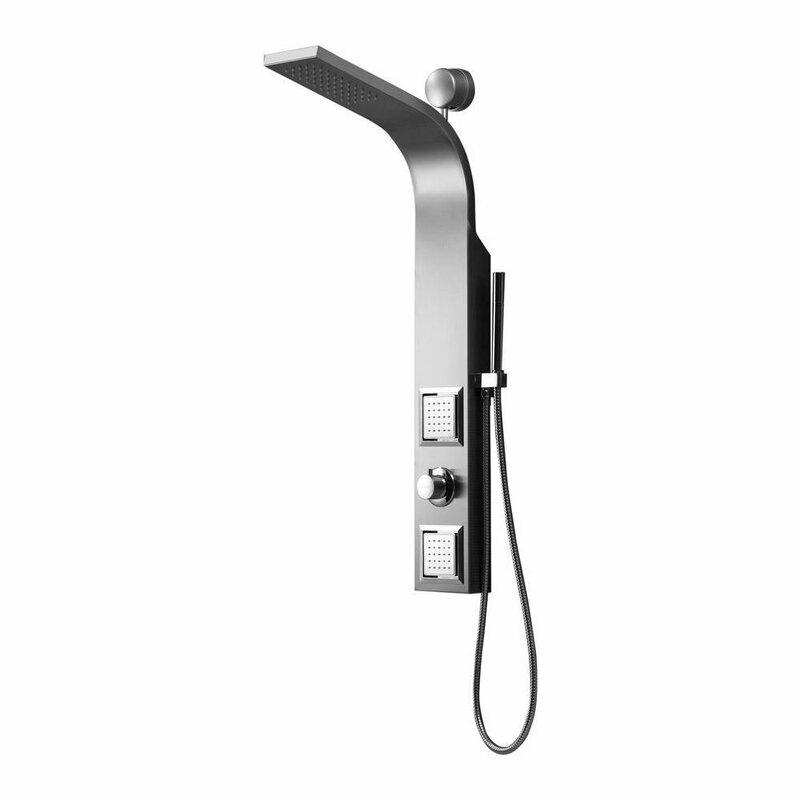 This product included a rain showerhead, hand shower, hose and two, large, fixed body jets. It also includes horizontal spray massage zones. If it is a complete shower transformation you want, the Barcelona shower spa may be your cup of tea. 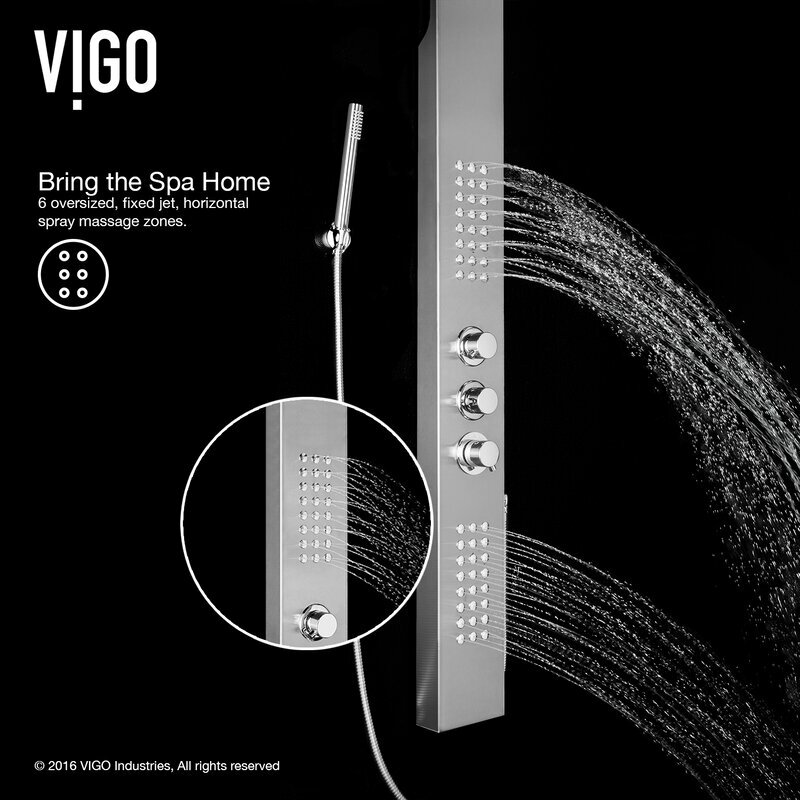 Made of elegant Venetian glass, you get a soothing rain shower experience that is situated on a pivoting arm. Easy to install in your hot and cold water supply lines, it secures to your wall with an easy to mount system. The Verona from Fresca has a contemporary, square shower head, hand shower, four massage jets, and even a tub filler spout. Everything you may need for installation is included with your purchase. 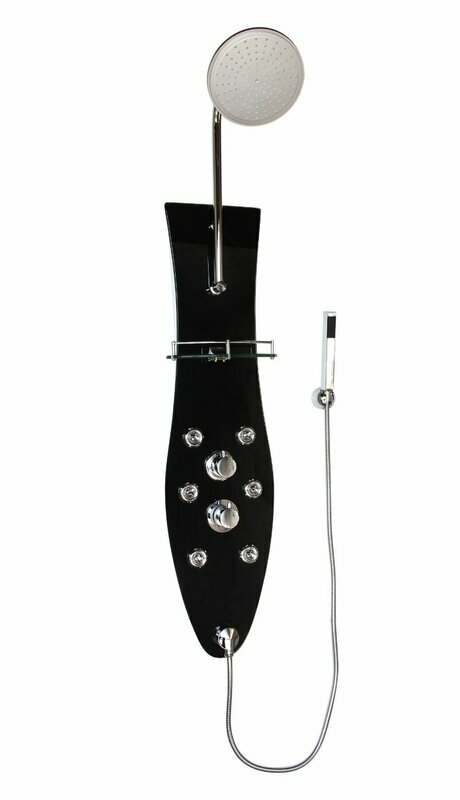 The stunning contemporary design that includes an adjustable rainfall shower head 8 body massage jets, handheld multi-function wand, and so much more, makes this rain shower head makes this one of the best shower panel systems around. This product sports an all-in-one package with all the extras. It has a beautiful, modern, chrome finish for easy cleaning. The Shower panel sports a white look for the ultra-modern in bathroom styles. Added to this the balance pressure that prevents temperature changes and you have something different all around. If your taste is borderline steampunk, you might consider this option, although it looks beautiful in any redone bathroom as well! The hand-forged copper panel with its oil-rubbed bronze features blends modern with a touch of whimsy to perfection. A stainless steel shower panel with an anti-fingerprint stainless steel casing makes this modern shower panel a surefire contender. 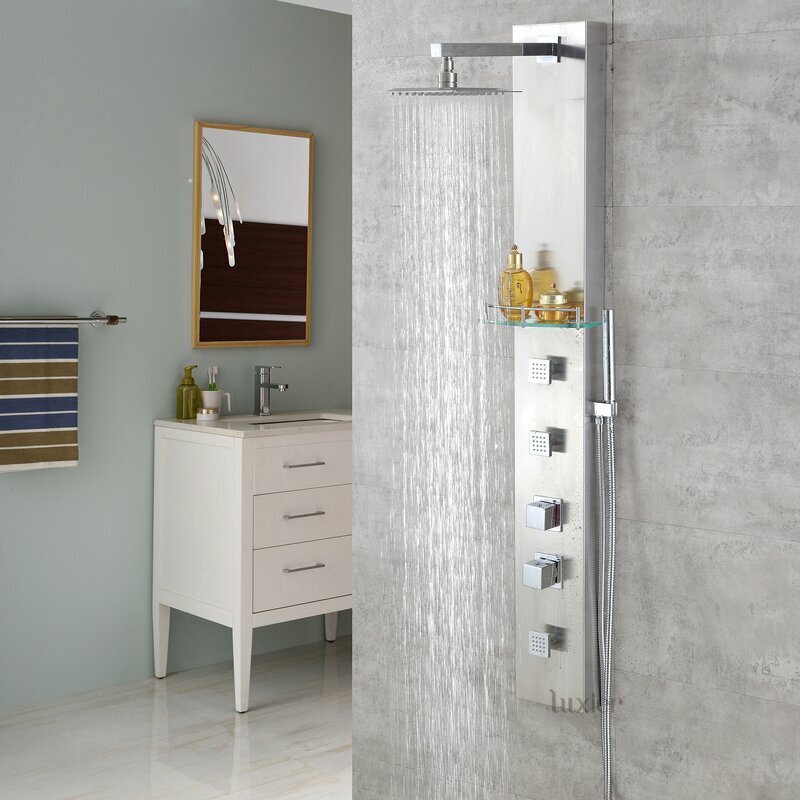 Stylish, sleek, modern, and sophisticated are what comes to mind about this shower panel. 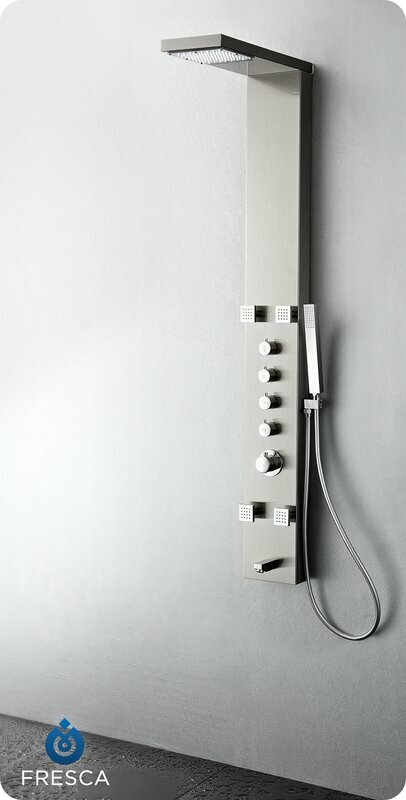 The twin shower unit has a built-in multi diverter valve and top quality finishes. A contemporary, organic design allows this shower panel to stand out from the crowd. It takes the art of relaxation to a whole new level. There are a number of reasons why shower panels are the way forward in bathroom design. Bathroom size is not an issue when it comes to shower panels. All you need is a connection and you are good to go. They fit in a regular shower enclosure, or even where your bath and shower fit the same space. At the end of the day, you still have your spa effect. They usually fit into your existing plumbing, saving you money. Shower panels adhere to water saving programs, helping reduce your utility bill. Keeping a shower panel clean is quick and easy. All that is needed is a quick wash with water, and a rub down with a soft cloth, ensuring that it sparkles like the day it was installed. When comparing pricing to bathtubs and shower enclosures, you will find that a shower panel is much more economical. Price, of course, depends on the model, material, color, and added features. A shower panel is easy to mount on an existing wall. Because no alterations are needed, you can mount it in the same spot as your previous shower, saving you the bother of finding more space. They are therefore perfect for both large and small bathrooms. Depending on your specific needs, you can pick a shower panel that suits you. Do you want a rain shower experience with the added benefit of a massage? You got it! Do you just want a regular shower with the benefit of a handheld shower head? You got that too! Shower panels cater any or even all of your showering needs. At the end of the day, the best shower panels around are limited by one thing – personal choice. 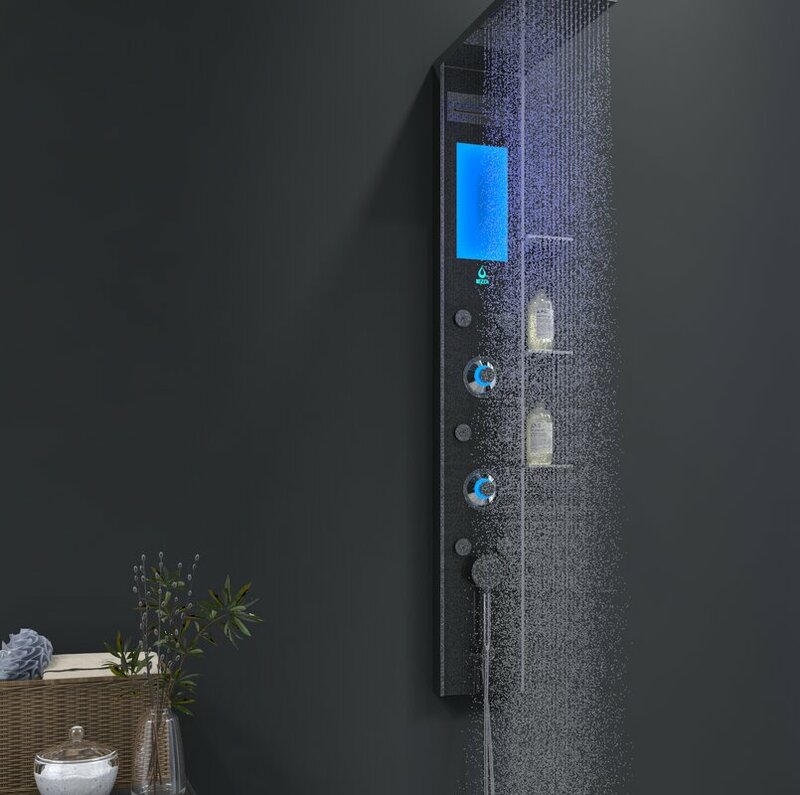 We, for example, like luxury, and because of this, opted to vote for the 1040 Barcelona Diverter Shower Panel by Pulse Showerspas as our personal shower panel of preference. What got our attention was not only its impeccable functionality but the fact that it is finished in Venetian glass, adding a touch of pure luxury and decadence. The handy glass shelf and air injected bubble technology are also plus points not to mention the luxurious six silk-spray body jets to help ease the muscles after a long day at the office.